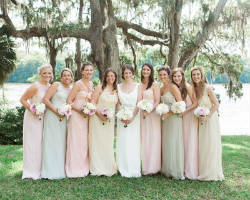 At Bella Bridesmaids, see heartened stylists Danielle Suarez and Megan Allen at work. Their hands craft a collection of traditional glamorous and sophisticated wedding amenities, find the perfect fit for a lady of all times. Have a very stylish party in the classic additions of bridal gowns at the industry. The outstanding shop at Kansas is well known for selling frills and thrills on bridal couture, to die for. Any day of the year, month or time of the day, Bella Bridesmaids has the matching wedding dress for you! Brides enjoy a full bridal service salon among best in wedding dresses at Kansas City, KS. Bella Bridesmaids bears a unique collection of the prettiest peplums, skirts, strong bodice, fabric, cuts and laces. Get to see them at stores, today! Laura's Couture Collection is a premier wedding boutique found at the heart of the state of Kansas. For the most eye-catching runway looks, the Laura's Couture Collection offers wedding dresses brides would absolutely love, today! The store specializes on selling unique vintage and trendy dresses, across premier boutiques at Kansas City. While, Laura's Couture Collection’s team of expert designers crafts the perfect fit for today’s bride. They are modern Kansas City wedding dresses that are used for the best wedding celebrations of the year. Grab yours this instant, Laura's Couture Collection promises brides to join them in the journey. There are certain ways to hold a complete wedding event. And, one of them is by wearing the finest gowns and wedding dresses to fit the occasion. Bridal Extraordinaire is the vision of two sister-in-laws. This family owned boutique offers modern and traditional styles of wedding gowns, bridesmaid dresses, bridal accessories and tuxedos!! Driven by their love of style and all-things wedding, these girls are committed to providing you a shopping experience you won’t forget. 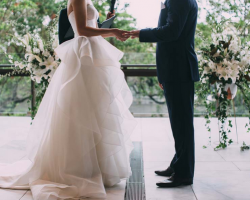 They have curated a gorgeous collection of gowns from new and well-known designers, that makes your search for the perfect wedding dress no longer a manhunt, but a true love story!